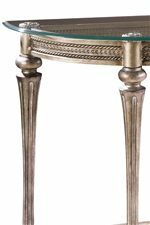 This enchanting cocktail table features an oval beveled glass top that rests on floral cast pucks, shaped and fluted legs and a rope twist and egg and dart carved apron. Measuring 50-by-32 inches, the glass top provides ample room for serving and entertainment. The cast resin base is finished in Brushed Pewter and features a beautifully decorated centerpiece. Add other tables from the Galloway collection for a coordinated group. The Galloway Traditionally Styled Oval Cocktail Table with Beveled Glass Top by Magnussen Home at AHFA in the area. Product availability may vary. Contact us for the most current availability on this product. 37526B Oval Cocktail Table Base 1 45" 28" 19"
37526T Oval Cocktail Table Glass Top 1 50" 32" 1"